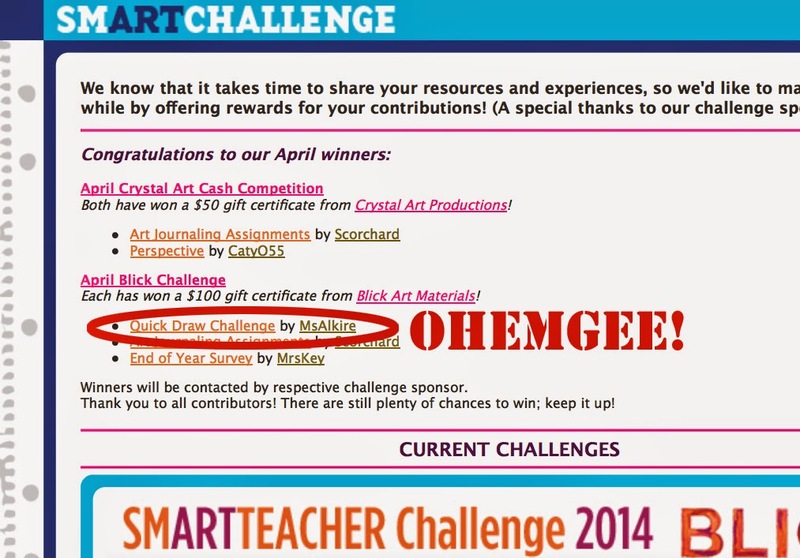 come to the Art side: Monday Mayhem: the smART teacher April monthly challenge I WON!!!! Monday Mayhem: the smART teacher April monthly challenge I WON!!!! I am soooooo excited! I can't believe it! I am literally screaming and dancing for joy! Each month the smART teacher has two challenges and if you meet the qualifications(they vary each month) then you have a chance to win a gift card from the sponsor of the challenge. Last month one of the challenges was to upload a worksheet and so I entered the Quick Draw Challenge page that I've been using as a bell ringer in class. I couldn't believe it! I am so thankful and so excited! Not only that I'm working on a presentation for my fellow elementary art teachers about International Dot Day with one of my colleagues. Busy busy day!! Friday Frenzy: Busy Busy & a Guest Blogger! It came!! No smart without art shirt! Sunday Share: Plástica, arte en la escuela. come to the ART side info cards!